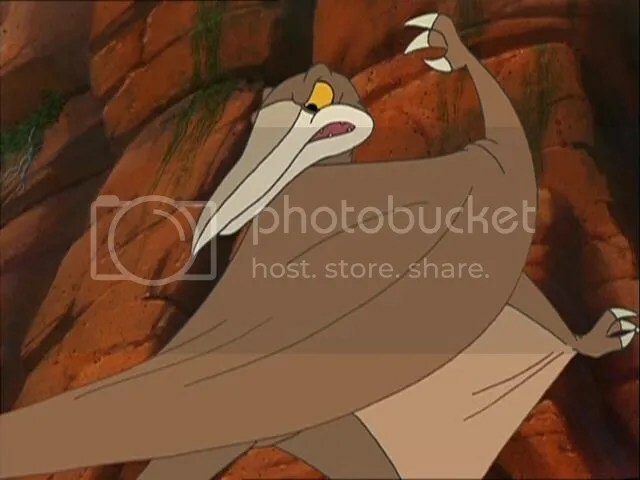 There is one Disney DTV sequel that I have as much nostalgia for as most of The Land Before Time movies. This is it. 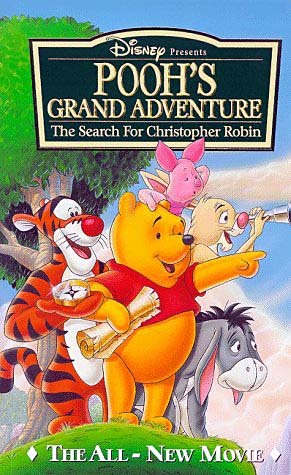 Despite having some sequel elements I always thought it was more of a film of The New Adventures of Winnie the Pooh partly due to having more of its actors and animation style. When I was younger I really loved it, and today I still like it and enjoy the songs. Right away the trailers talk about how Disney always offers “something new and exciting.” It then does ads for lots of films that are at least eight years old. The storybook look is gone, a butterfly looks ahead in fright foreshadowing the coming darkness, and the coloring is now darker. As expected it begins with Pooh being happy, and he gets even happier when he runs into Christopher Robin. Christopher Robin has a British accent unlike the TV series but like the film. Pooh Bear is still voiced by Jim Cummings from the TV series. Christopher Robin has to tell bad news, but Pooh does not want to hear it. He sings “Forever and Ever” about how long it can wait. It is the least good song in the film, but it has plenty of the charm that the character naturally brings. They then “do nothing.” A reference to the first film. It also contains the quote “You’re braver than you believe, and stronger than you seem, and smarter than you think.” I have heard this originated here, not in the book, and I could not find it in the book, making this movie the birth of many senior quotes. Pooh cannot remember it, but some of his attempts (“longer than a goose”) are funny. He then awakens the next morning to find it is Autumn (when school starts). He finds a honey pot and wonders who sent it. He starts to doubt he can eat it, and he decides to ask Christopher Robin, but he is not around there, or here, or anywhere. With him gone he is becoming lost. It is Pooh’s main arc. He then goes to Piglet (still played by John Fiedler). He is trying to conqueror his fear of heights like Christopher Robin said, but he is now stuck on top of the tree. until he is bounced by the greatest Disney character ever, Tigger. 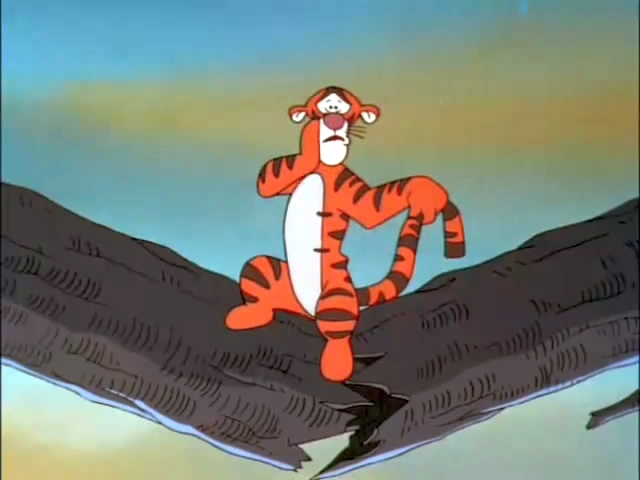 Tigger is still voiced by Paul Winchell. Hi arc is introduced as not being strong enough, which is similar to Rabbit’s but not Piglet’s arc. Piglet is the odd one as his is something he often struggles with, while Rabbit and Tigger have issues with their own gifts not being enough. He tries to bounce up and rescue Piglet, but he cannot and Piglet falls from the tree where Tigger does save him. at the meantime Eeyore makes his appearance. Eeyore is not important to this film actually. Rabbit’s arc about going by the book too much is briefly shown. Even rabbit cannot read the note on the honey pot so they go to Owl who proceeds to misread it that Christopher Robin is in danger from Skull. I would think that with the ending reveal that there was no real danger this would be lighter on a rewatch, but the colors are so dark, the characters are so dramatic while still clearly being themselves, and the images are similar to that of a haunted house to makes this very intense even on a rewatch. Owl says they must go on a quest, and he sings about it. As a kid I loved this song, and as an adult I still love I. I have hummed it many times. The map is clearly a little off, but eventually Piglet flees and he arrives at the real meadow. We now know the map is a little off, as the meadow was a little further than it was on the map. Piglet plays with butterflies until they carry him off like a flock of hawks. I know this sounds like a comical scene, but it comes off as incredibly dark. Even the most innocent looking things in the most peaceful place may kill you. Pooh while misquoting the earlier quote eventually gets Piglet down. One little problem is Pooh is so good at solving their problems he does no actually seem very lost. Rabbit, Eeyore, Tigger, and Piglet seem more lost. We then get to the rabbit’s song “If it Says so.” I am having bad memories of “Say Soes” from The Wisdom of Friends when typing that, but this is actually my favorite song in the film, and I have hummed it and sang it many times. Rabbit’s problem with taking the map at face value instead of thinking to himself is a major problem I also have. As you can probably tell from the picture the compass is wrong, and the map constantly says to go the unnecessarily long way. Rabbit accidently loses half of the map and Tigger chases it over a gorge. Despite that poorly animated still the gorge scene’s animation is very good. Tigger cannot get the map, and the log falls. He is now miserable about not being able to get it and he rescinds himself to death. Pooh then tries to get him out resulting in a stuffed animal ladder. Somehow Piglet is holding both Pooh and Tigger. Eventually Eeyore lets go of the root, and they all fall. Piglet sees his friends rising from the mud and thinks their monster until Pooh points out that they are his friends. 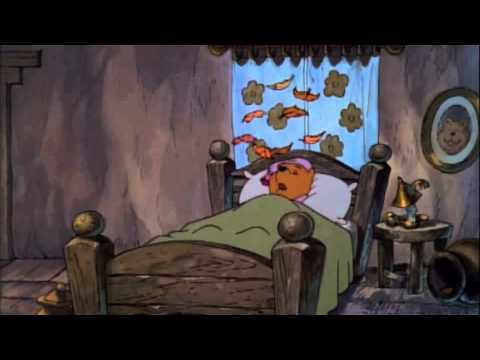 It does help further solidify Pooh as the most important member. 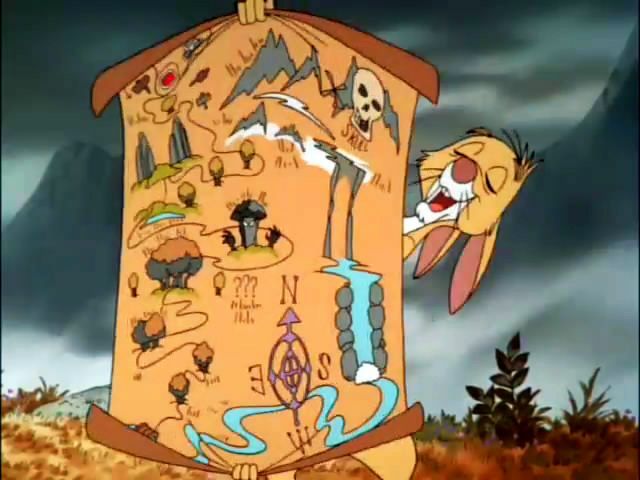 Even with the other half back the map is nearly useless, and Rabbit cannot figure it out. 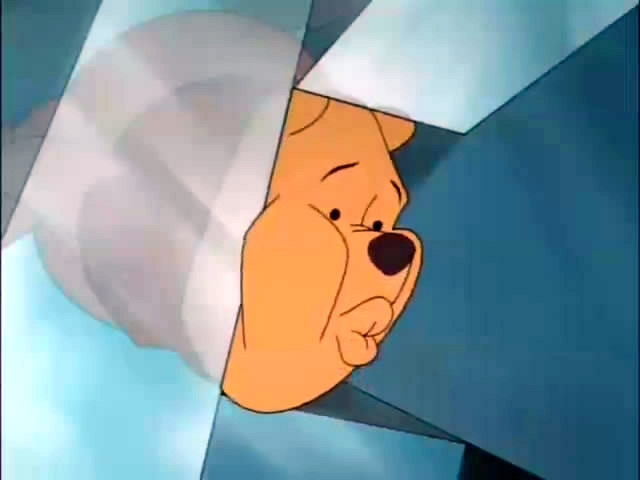 He gets really depressed and for a third tie Pooh cannot remember Christopher Robin’s comforting words right. They eventually find a cave to sleep in, while they are very depressed. 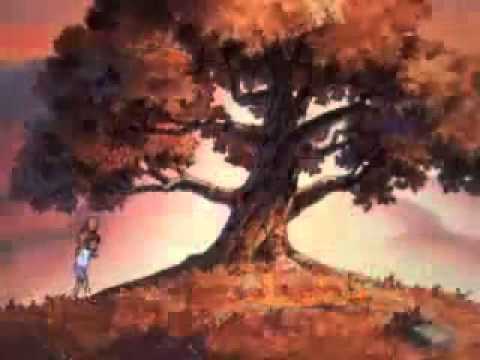 After a little comic relief from Tigger and Rabbit Pooh sings “Wherever you are.” It gets hard to believe that his actor did this and some notable villain songs like “In the Dark of the Night” and “Be Prepared.” The song has many verses that are a dark reprise from “Forever and Ever,” and it is very sad to see Pooh so depressed. This shot is the worst part of the film. He gets out only to get stuck in a huge chasm. He eventually realizes he will just starve to death in it. I have mostly neglected the honey pot in this review to save it to hear. It represents Pooh’s thoughts that he is forever separated from Christopher Robin, and he clings to it. They are only reunited when he is willing to abandon it. Pooh finally remembers Christopher Robin’s words and he realizes in a way they will never be apart. 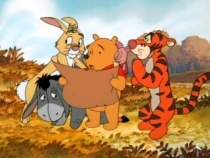 The rest of the group are all up thanks to Rabbit’s plan, Tigger’ strength, Piglet’s bravery, and Eeyore’s… extra weight slowing them down? They then see a scary shadow thinking it is the Skullasaurus, but it is Christopher Robin. I still do not know how he got there, but at this point I am happy to finally see the characters be happy again. Christopher Robin takes the note and reads out loud what it actually says. He also finds Pooh, and he rescues him with a huge honey pot he somehow carried over there and a rope. 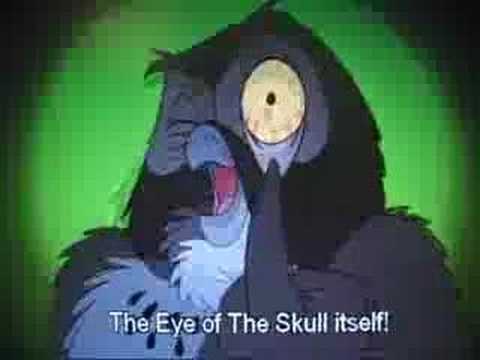 They leave Skull and see it is not scary looking anymore, and other places from the movie are shown to no longer be scary as well. The ending song is “Everything is Right.” I always really enjoyed it. It is very happy and the characters are shown using their new confidence and waving goodbye to the audience. Despite its late plot holes and misuse of Eeyore I really love it. It is by far the best of the Disney DTV films so far, and it is almost as good as the early odd numbered The Land Before Time sequels. The characters are still lovable, and I got to see them going through something harder than ever before. The writing is very good. The songs are great. I loved it so much as a kid I know most of the lines by heart. I heavily recommend it for children because of its dark yet child friendly tone.